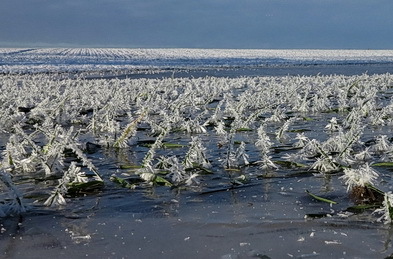 Flooding of winter wheat during in Denmark. The seedlings are frozen into ice and frost crystals have formed on the leaves. Apparently, winter floods are less disastrous than summer floods due to the low metabolism at low temperature. Oryza longistaminata is a giant rice species from Africa. As opposed to other species of rice, O. longistaminata forms rhizomes and can spread quickly by vegetative reproduction. Like other species of rice, Oryza longistaminata also possesses superhydrophobic leaf cuticles, which retain a thin leaf gas film during submergence. 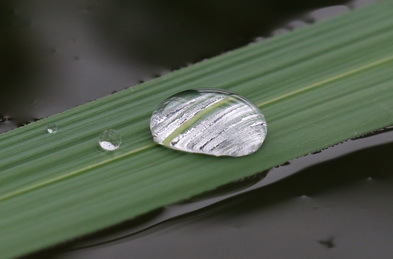 On the photo, the leaf gas film is seen a silvery sheen underneath the big water droplet. 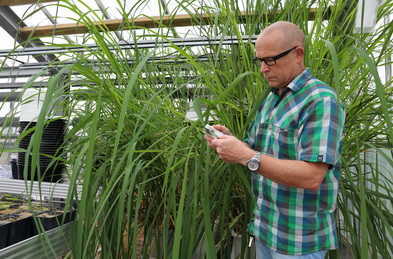 Rice and wheat both possess superhydrophobic leaf cuticles that retain a thin gas film when submerged. The leaf gas films greatly enhance exchange of CO2 and O2 with the floodwater during the day increasing underwater net photosynthesis. During darkness, the leaf gas films enhance O2 uptake from the floodwater and thereby sustain aerobic respiration. We have recently identified a gene, Leaf Gas Film 1 (LGF1) that codes for a C30 alcohol, which is a wax precursor. Mutation in this gene can lead to total loss of hydrophobicity and hence the mutant is a perfect tool in the eco-physiological study of the role of leaf gas films as flood tolerance trait. Leaf gas films are found in numerous plant species and the feature is not restricted to flood-exposed habitats. Superhydrophobic cuticles is an important trait resulting not only in gas film retention during flooding but also self cleansing in rain so that the leaf surface remains free from dust and pathogens resulting in longer leaf life spans. Although we have published more than 15 peer-reviewed papers over the past 10 year, we do not yet fully understand the regulation of leaf gas films, the importance for flood tolerance and survival - and most all, why the leaf gas film disappear over time. In all plants test so far, the hydrophobicity is lost with time of submergence and so the trait is not considered important for tolerance to longer term submergence but rather to floods that come and go such as in the tidal zone. Roots of wheat after exposure to toxic reduce iron (Fe2+). The roots that were exposed to Fe2+ appear red and rusty, they stopped growing but did not die. In the absence of Fe2+ during recovery, regrowth of new white roots were extensive. Wheat exposed to toxic concentrations of reduced iron (Fe2+) to the left and control plants to the right. Iron is toxic to plant roots but iron is also translocated to the shoot via the transpiration stream, and in the shoot iron can accumulated to toxic concentrations resulting in necrosis and ultimately in death of the shoot. The first stage of flooding is flooding of the soil where all the gas-filled spaces in the soil matrix is replaced by water. This process is referred to as waterlogging. Soon after waterlogging, the soil becomes anoxic because roots and microorganisms are using the available oxygen faster than it can be replenished by slow molecular diffusion from overlying atmosphere. This situation can be simulated in laboratory experiments by using hydroponic plant cultures growing in a stagnant, deoxygenated nutrient solution. In addition to the lack of oxygen, which is stressful in itself, phytotoxins start to accumulate in the soil water. Some phytotoxins are produced because anaerobic bacteria use alternative electron acceptors in the absence of oxygen. Examples are reduced manganese (which is not very toxic), reduced iron (quite toxic) and sulfide (extremely toxic acting on mitochondrial respiration the same way as cyanide). However, the incomplete mineralization of organic matter that appears during fermentation also result in accumulation of low molecular organic acids such as acetic, propionic, butyric and hexanoic acids. These are all toxic. A new PhD project aims at resolving the importance of the so-called root barrier to radial oxygen loss (ROL barrier) as a protective feature that restricts the influx of harmful soil substances using contemporary technology such as energy dispersive X-ray micro-analysis and sulfide microsensors. We will primarily use rice as model plant because the ROL barrier can be switched on or off during culturing and this enables in-depth studies of it function as a protective trait. See this page for more information on this exciting project! Progress on this topic funded by the Independent Research Fund Denmark and EU Horizon 2020 will be reported as blog posts.